The fifth annual Spaniel Journal Writing Contest runs through April 30, 2010. This year's theme is open to whatever inspires the writer. Both fiction and non-fiction entries will be considered - however, no poetry, please. Sharpen your pencil... and good luck! 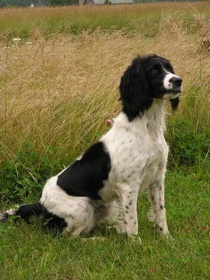 1st Place entry will appear as a feature article in the May-Jun 2010 issue of Spaniel Journal. Plus prizes to be announced. 2nd Place entry will appear as a feature article in the Jul-Aug 2010 issue of Spaniel Journal. Plus prizes to be announced. 3rd Place entry will appear as a feature article in the Sep-Oct 2010 issue of Spaniel Journal. Plus prizes to be announced. Additional placements may be awarded at the discretion of the editor. 1. Entry subject matter is open to whatever inspires the writer, fiction or non-fiction. No poetry, please. I'll be looking for a winner who can weave a good story. 2. Essays must be a minimum of two pages long - as typed in a word processor program and a maximum of four pages. 3. Each person is limited to one entry. 5. Attachments will not be accepted, please send your entry cut and pasted into the body of an email. 6. Previously published entries will not be accepted. 7. Published entries may be edited to correct spelling or grammar. 8. By submitting an entry to Spaniel Journal, the writer agrees to allow Spaniel Journal to publish the essay.